Home | Golf For Blind | Inc. 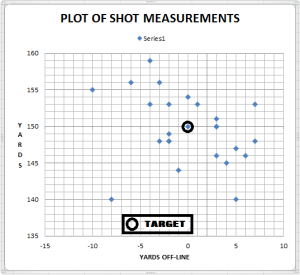 In 1994 we completed a prototype system to measure shots at targets on a range, and developed a scoring system based on statistical quality control. Our technology willl enable the blind and their coaches to quickly perfect golf shots at targets that are competitive with sighted golfers. These measured and scored target shoots will form the basis of the first ever paralympic sport for blind golfers. “We started with NASA’s Office of Technology Transfer and located a technology and technology supplier which enabled us to demonstate golf shot tracking and measurement on ranges across the Southeast. Dr. W. Edwards Deming, credited with teaching statistical quality control to the Japanese to help them become a world leader in automobile production, acknowledged our use of statistical process control on the golf range during practice and competition. 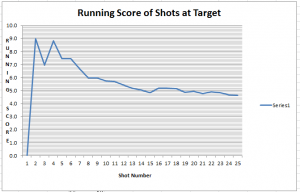 This is plot and score of 25 shots at a 150 yard target. Teach Blind Golf the right way!